Are you looking to add knowledgebase to your website? We are ready to show you how to build a Wiki site with WordPress. There are three known ways to do that. The easiest way to use Wiki on your site is to use WordPress knowledge base theme. Please, note that is has to be installed to some subdirectory on your server. The main disadvantage of this method is that you cannot use it in case you have working site already. Many websites have their knowledgebases on subdomains. That is normal practice. If your theme doesn’t contain Wiki knowledgebase by default you can easily insert it using a WordPress wiki knowledgebase plugin. You can find several plugins available on WordPress official website. We recommend using Knowledge Base by PressApps one. All that is required is plugin installation. Do that as usually under the Plugins > Installed Plugins > Add New section in your admin panel. Once it’s installed your have Knowledge page in your WordPress backend. This area is a set of custom posts that allows you to organize your own knowledgebase. Another way to add Wiki knowledgebase to website is to create dedicated website using the code method. Navigate to Plugins > Add New page in your WordPress backend. Enter Knowledge Base CPT to the search field. Activate theme after upload. After plugin activation you will have custom post type called knowlage_base and it is called a taxomony in your admin panel. 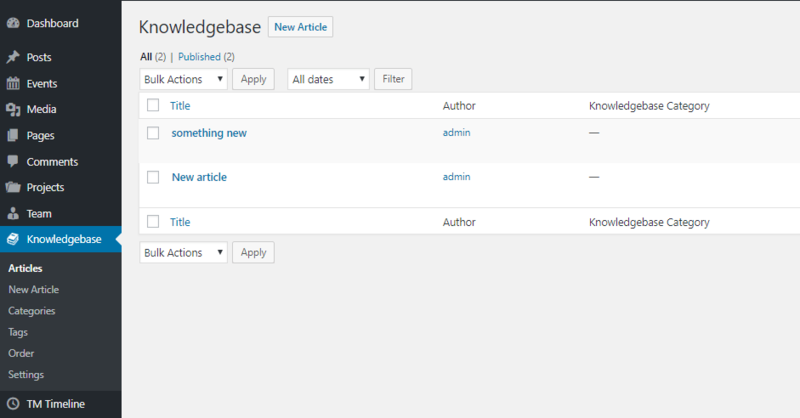 You can easily add and organize articles in your admin panel under the Knowledge Base tab. Once you have several articles ready you will need to organize your knowledgebase page. This code lists all the articles under the section they are added into. Next step is page creation. That is usual procedure. Do that under Pages > Add New page in your backend. Save the page and check your site. Please, note! CSS code may differ for the theme you use. Each theme has specific CSS classes. We hope this article was helpful. If more help is required you can check our tutorials. If you’re looking for a professional template to build a website, view WordPress Themes.